Since 2008, after much careful study, I have done my best to warn everyone of Barack Hussein Obama’s ties to Islam. For the first 4 years of his presidency, like most Christians, I was mocked and seemingly no one wanted to believe it. By 2012, many eyes were opened and hearts were turned to begin to believe all that I had preached about Obama’s love for the muslim faith, especially after 4 years of open disdain and hostility toward Christians, Jews and Israel. Sadly, not enough eyes were opened to stop him from getting reelected by the majority of clueless ignorant Americans. In the past 7 years, not only has none of what I taught about Obama and Islam been refuted, but he has done even more to add creedence to my beliefs that he is indeed a Muslim. I have many reasons why I’ve believed this, and will lay most of them out in this article. One of the biggest reasons came just YESTERDAY, as Obama once again showed an obvious favoritism of Islam over Christianity. It also showed how much his reverence and honour for Allah greatly trumps any respect for our Lord Jesus Christ. 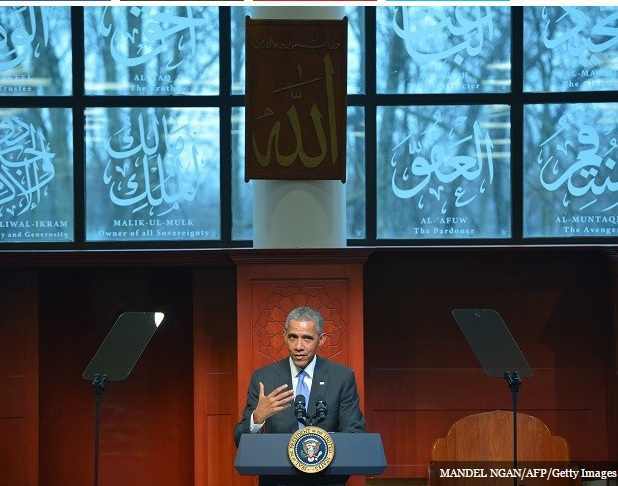 In what many are calling a gross double standard, and hypocrisy by the sitting president, Obama gave a speech at an Islamic Mosque yesterday in front of a wall displaying the name “Allah” 99 times, yet he ordered the Name “JESUS” to be COVERED UP when he gave a speech at a Catholic University. 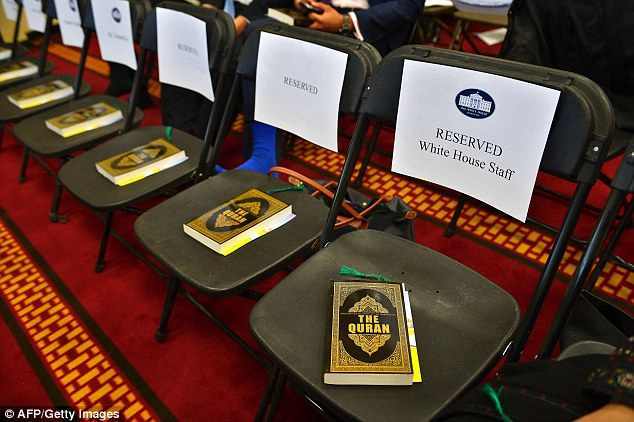 As if that wasn’t bad enough, The White House staff were all gifted Qurans at the event by the president, while of course no Holy Bibles were gifted at his Catholic event. Three and a half years ago, Obama told Georgetown University to cover the symbol IHS, which is an abbreviation for The Name of JESUS derived from IHΣ (the first three letters of the Name Jesus in Greek), or else he would not give his speech. Sadly, the University complied. 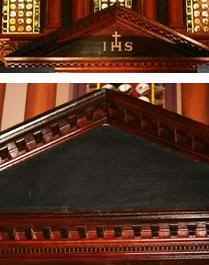 The Name of Jesus was shrouded with a triangle of black-painted plywood during Obama’s speech. Yet, Obama had no qualms speaking on National television in front of the name of Allah at the Islamic Society of Baltimore. Something is definitely fishy and very wrong when the president has a problem being in the presence of ONE mere abbreviation of the Holy Name of our Lord and Saviour, but has absolutely no problem being surrounded by nearly 100 visible names of Islam’s god. The White House did not respond to media requests to comment on the covering up of Jesus’ name at Georgetown. 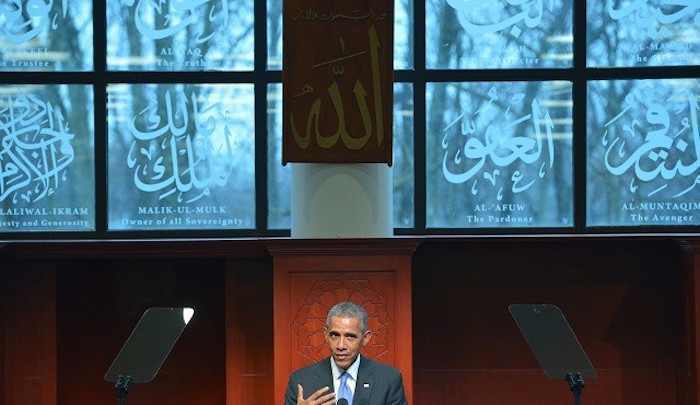 The Mosque in which Obama spoke, the Islamic Society of Baltimore in Maryland, is affiliated with the Islamic Society of North America, or ISNA (a Muslim Brotherhood front organization). Leaders of the 47-year-old mosque are known to be staunchly anti-Christian, anti-Semitic and anti-Israel. Obama was informed of the mosque’s links to Islamic terror, but agreed to speak there anyway. Well known Al-Qaeda terrorist, Anwar al-Awlaki, was an imam at the mosque, and the Fort Hood terrorist, Nidal Hasan, also attended services there. This is probably all a great shock to many reading, but not to me. I’ve known of Obama’s love for Islam and his animosity toward Christianity for a long time. As his presidency is nearing it’s end, I believe he’s being more bold in not hiding his true beliefs because he has no reason to any longer. He’s already deceived the American people twice to serve an 8 year presidential term, and has passed so much pro-Islam, anti-Christian and anti-Israel legislation that he is finally satisfied enough to let the mask come off. All we could do now is impeach him, but sadly Republicans aren’t willing to go that route and are reserved to focusing on the November Election. 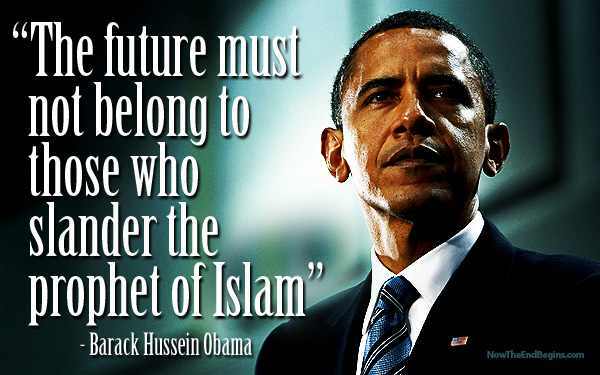 His Islamic faith has been crystal clear to me from the start. All you have to do is look at his history, which is available publicly for anyone to analyze. His middle name, “HUSSEIN” is strictly an Islamic name, particularly among Shia muslims. It was first used by the founder and so-called “prophet” of Islam, Muhammad, when he named his grandson Hussein Ibn Ali. Obama’s father was a Muslim from Kenya, and his stepfather was also a Muslim from Indonesia. Obama’s mother was all over the map on religion, as Obama stated himself that she had observed Muslim, Buddhist, Hindu, Christian, Norse and African traditions. While in Indonesia, Obama attended a madrassa, a Muslim Seminary, for at least 4 years. His school friends recall that they often went to the mosque together. 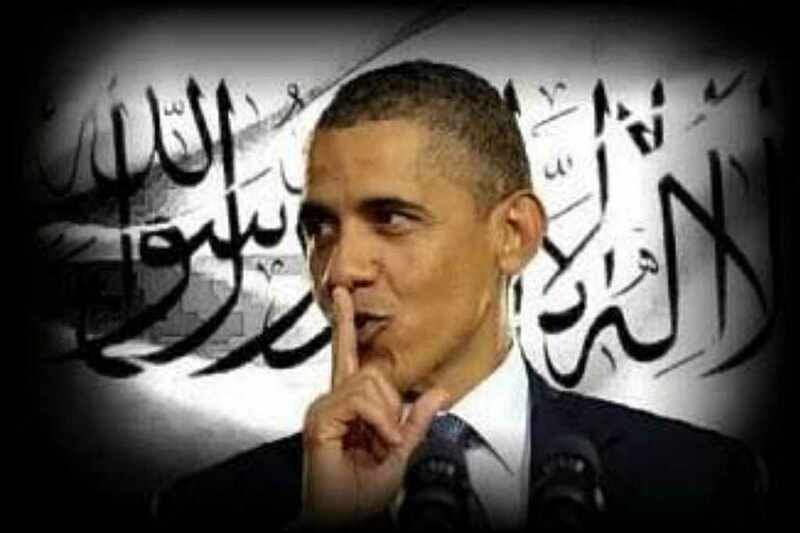 It is in the Muslim seminary where Obama learned to recite the Shahada, the Islamic declaration of faith. Obama says that he is Christian, but there is a term in Islam called “Taquiya” which means that you can openly lie about your faith and deceive non-muslims in order to “further the cause of Allah and Islam”. This is something Obama has unquestionably done in one of the most powerful leadership positions in the world. Obama says he was baptized a Christian by the United Church of Christ under Reverend Jeremiah Wright in 1988, the Church he attended for 20 years. The UCC is not “Christianity” as you and I know it. The controversial pastor, Jeremiah Wright, declares that “the God he worships is the SAME AS ALLAH, the God of the Muslims.” He preaches Black Liberation Theology, which was inspired by the Nation of Islam. 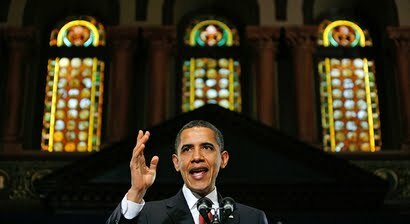 Obama has publicly stated numerous times that America is NO LONGER a Christian Nation. He has also said that Islam is part of the fabric of our Nation. BOTH are false statements. Obama promised to radically transform the USA and in my opinion, sadly, he has succeeded. He has immigrated more muslims into this Country than any other president in American history, while at the same time DENYING entry to the persecuted Christians being raped, beheaded and crucified in Islamic lands. 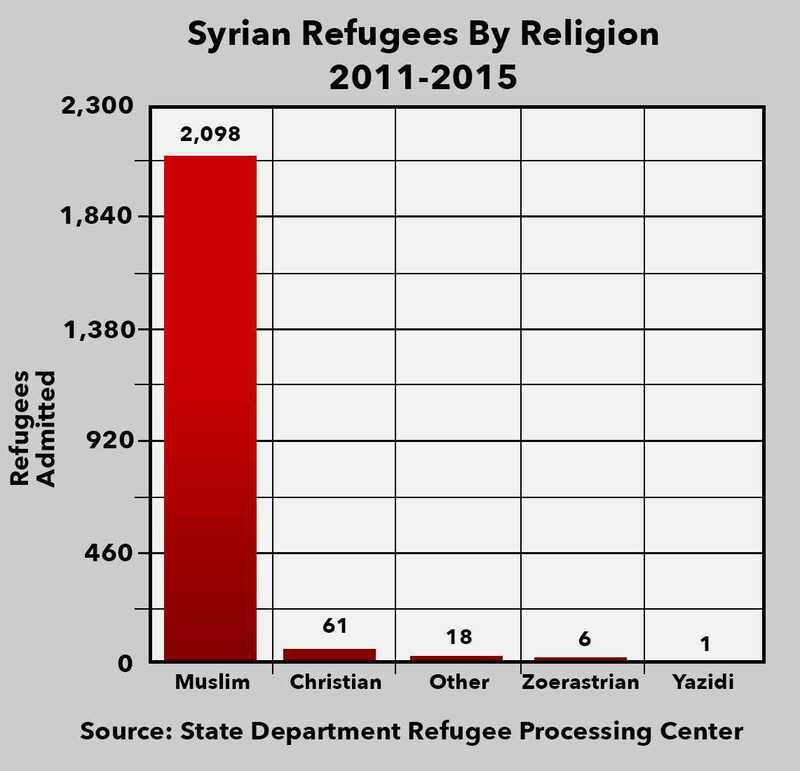 Since Syria’s Civil War began in 2011, the Obama Administration has accepted over 2,200 refugees, but only about 60 of them have been Christians. Yes, you read that right, SIXTY with one “0”. The majority over 2,100 of them, or 96%, have been Muslims. What a disgrace! Jesus my creator my saviour and only one to worship. thank you!! this is obviously awesome, and awesomely obvious. SO sorry Mr. President that you choose not to represent the LORD and SAVIOUR JESUS CHRIST…….. you are the leader of OUR COUNTRY WHICH IS ONE NATION UNDER GOD…. you can never change this. if this is the way you feel why don’t you just gengerly go to OUR WHITE HOUSE and pack your belongings and exit that premisis because the BORN AGAIN CHRISTIANS HAVE ANNOINTED THAT PROPERTY WITH PRAY YES IT IS PROTECTED BY THE BLOOD OF THE LAMB… JESUS CHRIST WHO HUNG ON THE CROSS AND DIED FOR US AND OUR SINS…. Excellent, excellent article and work! Well done, Michael!